India, Arun Jaitley said, is a net buyer of oil and is adversely impacted when rates go up "temporarily". Finance Minister Arun Jaitley Wednesday remained non-committal on cutting excise duty to cushion spiralling petrol and diesel prices, which touched an all-time high, saying international oil prices are volatile and have not shown any linear movement. Mr Jaitley defended criticism that he and External Affairs Minister Sushma Swaraj as opposition leaders had mounted against the previous UPA government on the issue saying inflation during those times was in double-digit and they would have failed in their duties if they had not criticised the government of the time for its failure to curb fuel prices contributing to further price rise. India, he said, is a net buyer of oil and is adversely impacted when rates go up "temporarily". He termed such movement as "an external factor". "There is no straight line movement of global crude oil prices. They go up, they come down. In April and May, there was a lot of pressure. In June, they came down. In July, they came down and in August, there is again (an upward) movement. In last two days, there has been some moderation. For six days before that, there was a gain," he told reporters here. He was asked about petrol and diesel prices touching an all-time high and demands by opposition parties for a cut in excise duty. On asked if the government need to be prepared if crude prices go up further, he said, "Well policy formation is never a rigid process". Asked about the BJP criticising UPA when it was in opposition on the issue, he said, "We rightly criticised the UPA government then because on inflation there is a huge difference between 11 per cent during UPA and a consistent 4 per cent inflation during NDA". "Our record on inflation management has been exemplary. We inherited an 11 per cent inflation and certainly we would have been failing in our duty if Sushmaji and I as leaders of opposition had not criticised it," he said. The rally in fuel prices has been driven by rupee dipping to an all-time low, making imports costlier, and rise in crude oil prices. The rupee has fallen to a record low of Rs 71.75 to a dollar, depreciating by over Rs 3 in a month. Also, crude oil has gained USD 7 a barrel in a fortnight, driven by fears that the US sanctions on Iran will likely contract supplies. Petrol and diesel prices Tuesday touched fresh highs. Rates in Delhi rose to Rs 79.31 a litre for petrol and Rs 71.34 for diesel, renewing calls for a cut in excise duty to cushion the spike. Almost half of the retail selling price of the two fuel is made up of central and state taxes. Prices have been on fire since mid-August, rising almost every day due to a combination of a drop in rupee value and rise in crude oil rates. 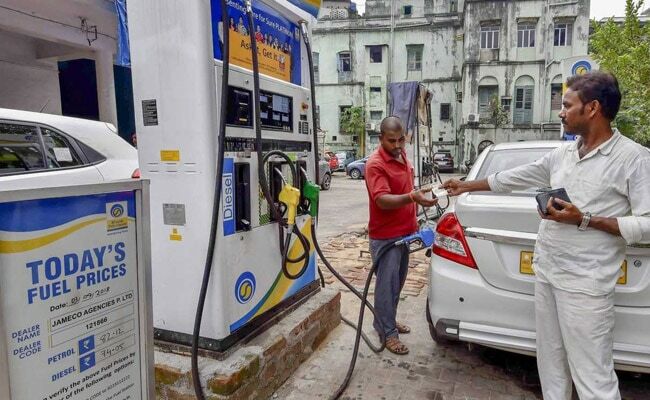 While prices were not revised today, rates for petrol have gone up by Rs 2.17 per litre since August 16, while diesel rates have climbed by Rs 2.62 - the biggest increase in rates witnessed in any fortnight since the launch of daily price revision in mid-June last year. On Tuesday, former Finance Minister P Chidambaram had stated that the "Relentless rise in prices of petrol and diesel is not inevitable. Because the price is built up by excessive taxes on petrol and diesel. If taxes are cut, prices will decline significantly". The Centre currently levies a total of Rs 19.48 per litre of excise duty on petrol and Rs 15.33 per litre on diesel. On top of this, states levy Value Added Tax (VAT) - the lowest being in Andaman and Nicobar Islands where a 6 per cent sales tax is charged on both the fuel. Mumbai has the highest VAT of 39.12 per cent on petrol, while Telangana levies the highest VAT of 26 per cent on diesel. Delhi charges a VAT of 27 per cent on petrol and 17.24 per cent on diesel. The central government had raised excise duty on petrol by Rs 11.77 a litre and that on diesel by 13.47 a litre in nine installments between November 2014 and January 2016 to shore up finances as global oil prices fell, but then cut the tax just once in October last year by Rs 2 a litre. This led to its excise collections from petro goods more than doubling in last four years - from Rs 99,184 crore in 2014-15 to Rs 2,29,019 crore in 2017-18. States saw their VAT revenue from petro goods rise from Rs 1,37,157 crore in 2014-15 to Rs 1,84,091 crore in 2017-18. A litre of petrol in Mumbai costs Rs 86.72, while diesel is priced at Rs 75.74 per litre. Prices in Delhi are the cheapest in all metros and most state capitals due to lower sales tax or VAT.